After all the politics and speculation this week, it was good to sit up late for the first two practice sessions of the Chinese GP. There is nothing like action on the track for reminding one of what the sport is really about. It was also an occasion for a few "I told you so"s. McLaren had an evolutionary diffuser, not quite double but more than single, and both drivers used it to good effect, Hamilton proving quickest in the first session, Kovalainen (remember him?) fourth fastest. Max Mosley really ought to reconsider his tactics in his war with McLaren - all the mud thrown just seems to make the team try harder. Admittedly that first session was one for tire testing and warming up the circuit and times meant little. It was in the second session that the true pecking order became more evident, the McLarens slipping down to 9th (Kovalainen) and 13th (Hamilton) and Rosberg putting in a bid for fastest time of the day. This time the Williams driver was beaten by Button with Barrichello hot on his heels with third quickest lap. The double diffuser boys are still in front but only just, Red Bull being very close and Toyota dropping away a bit into 6th and 8th. Perhaps the story of practice, however, was Ferrari and its troubles. Like all the teams, the red cars had problems with graining but theirs were most spectacularly obvious. On board shots of bits of rubber flying off the front tires and past Massa's ear made it clear that KERS and diffusers are the least of Ferrari's worries for the race. At this rate, both Raikkonen and Massa will struggle to make it into Q3. Everyone had cause to criticize the tire compounds supplied at this race, once again calling into question the FIA's tire rules this season. The harder compound proved difficult to heat up to operating temperature, while the super softs did their usual trick of lasting five or six laps only. How this is supposed to add to the show is anyone's guess, but I would question the policy on safety grounds alone. How long will it be before we have a big accident caused by an exploding super soft tire pushed a little too hard? It should be remembered that this situation is caused by the FIA wanting a greater differential between the two compounds for each race. Apparently, last year the difference was hardly noticeable, cars being able to give good accounts of themselves on either compound. So the aim must be to have a greater gap between the cars according to which tire they happen to be on. We asked for more overtaking and this is what we get. 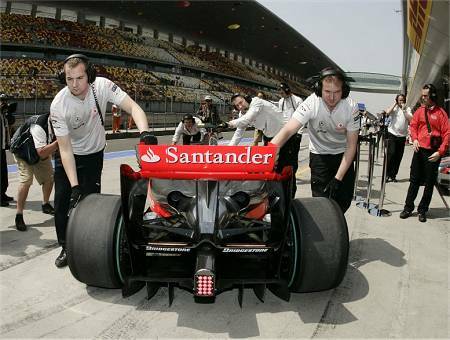 Cars on soft tires can overtake others on hards and then be retaken after a few laps when the softs go off. Brilliant, isn't it? I think we should have been more specific in our request and asked for meaningful overtaking, not a lottery. I had not meant to say too much about tires, seeing that F1 Fanatic has a very good poll and article on the subject, but they were really the main talking point of practice so far. And perhaps the most interesting thing about them was that they had little influence on fastest times - the super softs were marginally quicker for a lap or two, but no more. The real difference was wear rate and it is going to be very difficult for the drivers to make the option tire last long enough for a decent race stint. So everyone will have a short stint with the softs at one time or another in the race and the real competition will be in the longer stints. Does this amount to a fascinating strategic battle in which the cleverest team wins? I think not; it looks more like an artificial blanket strategy forced on the teams by a governing body obsessed with TV viewing figures. When will they learn that we come to see motor racing, not to admire the tactical skills of the men on the pit wall? One of the reasons Michael Schumacher was detested by so many F1 fans was because he often won races through strategy rather than sheer speed; we felt cheated that the quickest driver had been beaten by a man sitting in the pits with a computer on his lap. That man was Ross Brawn, of course, and he is now in a position to demonstrate his skills again - give him a decent driver in a competitive car and he will squeeze out the wins wherever possible. This situation is not helped by tires being so influential in choice of race strategy. Ross has designed a car that uses its tires better than any other to date and he is about to prove that there is much more to the BGP 001's advantage than a fancy diffuser. By the end of this season, there are going to be many fans who have grown to hate the sight of Button on the top step of the podium. And much of that will be thanks to a wily old fox with a lap top sitting on the pit wall. I'm going to crosspost what I said in the comments at F1Fanatic and disagree that passes that happen because of the tyre performance difference are meaningless. Artificial, yes; but meaningless, no. In fact, the urgency for overtaking is increased because if you’re running on the stronger tyres, you need to get by as quickly as possible to open up a gap over the course of your stint to offset the upcoming stint in which you will be at a disadvantage. If strategic considerations are set aside, it actually puts the race more in the hands of the drivers, who are now in the position of the Red Queen–they have to to overtake just to maintain their position. It places a premium on overtaking (as well as defending), and those drivers who have the ability to overtake quickly, efficiently, and creatively (or to defend relentlessly) now have greater opportunity to use it. You could even argue that this is more fair, because all other things being equal, two drivers of equal pace but on different strategies will each have an opportunity to overtake on one stint and to defend on another. It’s a bit like a home-and-away football series–the winner of the position is going to be decided on the aggregate of their overtaking and defending abilities. You're monopolising the voice of reason again Clive. I agree. It seems we could require the teams to do a stint on roller skates and have the same effect. Strategy and speed differential might make for an interesting race if the differential wasn't so big and the softs didn't go off so fast. 5 or 6 laps before the tire is disintegrating is rediculous. Just give the teams all the compounds and let them choose 1 that works for them. All this futsing around to improve the "show" justs detracts from the racing, which is what we come to watch. Disgusting!! Mark Z: I understand what you're saying but rarely do things work out so neatly in the race. Other cars intervene, complicating the issue, timing of pit stops can make all the difference, some cars treat their soft tyres better than others, there are so many factors to take into account that it becomes impossible to say whether two such diverse compounds makes any difference to "the show" at all. The only instance I can think of where the two compounds had an important effect on the racing was in the Vettel/Kubica battle at the end of the Australian GP. Kubica on hard tyres was closing rapidly on Vettel, whose soft tyres were shot. And we all know what happened as a result - not a pass but an accident. Artificially affecting the performance of the cars at different times in the race does not add to the show - it merely leaves the occasional driver out of position and closing on those in front of him, something that happens often enough in racing anyway so that we do not need to introduce it artificially. Lonny: I agree with your solution - let Bridgestone bring all the compounds and let the teams choose which they want. "Lonny: I agree with your solution - let Bridgestone bring all the compounds and let the teams choose which they want. " But then if all the teams run optimum tyres, it's more likely that the field will stretch out and we see less overtaking. Let's face it, the casual fan does not even bother thinking about the strategy, he just watches the overtaking for what it is. And it has worked, more and more are indeed watching F1. I'd rather go back to the 2007/8-spec solution. Journeyer: One minor question: are you sure more people are watching the TV broadcasts? And, even if they are, that is as likely to be due to other factors (such as huge media coverage of F1's interminable scandals) as it is to any increase in overtaking. I would guess that the sport would grow a more loyal viewership, if a little more slowly, if it were not subjected to the artificial changes constantly introduced by the FIA. Mark Z: Basically, I am against tyre, fuel and pit stop strategy having too great an influence on the races. I can admire Brawn's tactical genius while still disliking the fact that it often gives the prize to a driver who has not been the best on the day. I admit that my beef against the tyre rules this year is that they introduce artificial strategies that tend to cancel each other out. No doubt some drivers will handle this additional scope for tactical advantage better than others but I would rather see one good overtaking move executed by a driver on the same tires as the one he is battling with, than a dozen successful moves by a driver on better tyres than the other. It destroys our respect for a driver's skill if we know that an overtaking move was possible merely because he was on the right tyre at the time (or because he had KERS and the other guy did not, for that matter). Take the battle between Hamilton and Webber in Malaysia for example. Each passed the other several times, each time at a part of the circuit where their individual advantage was greater than the other's - Hamilton passed when KERS could make the difference, Webber when superior handling counted for more. So who is the better driver? The contest has become meaningless because the technology was doing the work, not the drivers. The same applies to tyres. If a driver on new soft tyres can pass another on tired mediums, what does it prove? And where is the meaning in the advantage of a car on hard tyres over one on softs that are past their best? The tyres become the dominant factor in overtaking moves and we learn nothing of the skills of the drivers involved. As I said, these differences tend to cancel each other out over the course of a race and we end up with a finishing order that is pretty much as it would have been had there been only one tyre compound to choose from. Sure, there is more overtaking when you complicate the issue with different compounds forced on the drivers, but it is artificial and meaningless as regards racing. As usual, it is the fight between entertainment and racing that we are really talking about. And it may be personal taste, but I would rather see Heidfeld make three overtaking moves on two cars at once in an entire season, than lots of tyre- and technology-created overtaking in one race, all of which turns out to have very little effect on the final result. The other thing to wonder at concerning TV figures is whether the move to the BBC has influenced it for the better. Between the better coverage, better publicity and possibly greater loyalty from the sample of 5000 households who provide the British TV viewing data, there is a lot of scope that the media themselves could have generated the increase independently of anything F1 itself has done. Fairy tales like Brawn help a lot, too. It's a bit like the Hamilton effect; that was made into a fairy tale by the press and even explaining in the broadcasts that he'd been prepared for 10 years by McLaren didn't shake the feeling that something magic was happening in the eyes of casual observers. Maybe F1 just needs more stories*. * - That's proper stories with narrative, a goal worth achieving involved and a happy ending, not the stories the press turn out by the dozen that are based on one specific incident, often involve a goal of ambiguous value or no goal at all (for instance the bad news of yet another pointless court case) and often turn sour. Fair points Clive! But in my opinion, you can't read too much into any single pass. If the driver who passes the other driver should always be the one of greater skill, then how did he end up behind the poorer driver to begin with? The only possible reasons are strategy, inferior equipment, or other artificial contrivances (under which I include qualifying, since single-lap pace the day before a race often has nothing to do with race pace. That the rankings of times for a single lap should signify anything is pure convention). You mentioned you didn't like the Hamilton/Webber battle because their cars had different strengths on different parts of the circuit--for me, that was exactly why it was so fascinating. To me, it's just a car down on power but with handling capability, and another car with power but no handling, which happens all the time anyway and hasn't ever stopped me from enjoying battles like it before. Unlike the option tyres, the teams are not forced to run with or without KERS, and so the fact that the deciding factor was the presence or absence of KERS makes it no more artificial than the presence or absence of any other particularly well designed part of the car; and if you don't want to deal with that, you might as well run a spec series (nothing against spec series!). Speaking of reducing the importance of pit strategy, I'm curious what you thought of Champ Car's efforts a few years back to do so by instituting mandatory pit windows. Any thoughts? Mark Z: We are reaching understanding, I think. In particular, the information that you are American explains a lot and makes this discussion even more interesting! Let me answer your points one by one. Apart from the reasons given by you for a better driver being behind a poorer one, there are several others. A poor start through slipping clutch or anti-stall cutting in (thank you Rubens! ), accidents in front of our chosen specimen driver that require him to take avoiding action, a car that gets better as the fuel load lightens, the possibilities are many. But it is not always the case that the better driver overtakes the one less talented. Take the famous instance of Sato passing Alonso in the Canadian GP of 2007 as an example. Nobody would argue that Sato is a better driver than Alonso; it was thanks to Alonso's tires being shot while Sato's were fresh out of the box that the pass became possible. And that I don't object to - it's up to each of the drivers to manage his tires as best he can, after all. Actually, I didn't say that I did not enjoy the Hamilton/Webber battle. It was entertaining but my enjoyment was marred by the awareness that it was happening because each driver had a weapon that was superior in some parts of the circuit but not so in others. It was essentially a battle between technologies, not drivers, and so was interesting but not hugely indicative of relative skills. It's a delicate balance between technology and skill and the FIA is trying hard now to re-establish the balance so that technology is less dominant than it has been in the last couple of decades. A spec series would be sending the balance way too far in the drivers' direction. And so we come to America. Interesting thoughts, Mark, and I do not deny the excitement of the traffic jam races so common in the States. I have been watching more NASCAR of late and am beginning to understand why you guys like such things so much. But it's not F1! Maybe it's because Europe is one big traffic jam that we have come to hate the things. In the States, only the big cities have anything like the jams we experience every day in our cities, towns, motorways, even villages. The last thing we want to see is yet another traffic jam, no matter how fast it moves! Come to think of it, much of the M1 and M6 (and M5 at vacation time) is exactly like a NASCAR race, hordes of cars all exceeding the speeding limit while packed together like sardines and still jostling for position. I think our attitude is "Been there, done that, got the T-shirt - now let me relax by watching technical wonders being driven at their limit by brilliant drivers with space to demonstrate their skills. Mandatory pit windows? I would be wary of the idea, firstly because I think pit stops can ruin interesting mid-race battles battles and secondly because I'm an old fogey and want everything to return to the days when you pitted because you had a problem, not because your car had too small a fuel tank to last the entire race or the tires foisted on you could not go a race distance. Again, it's a matter of taste and I say, "Forget all the artificial attempts to spice up the show - just let 'em race!" Yes Clive, this is quite an interesting discussion! I concede that passing a driver who gets a poor start is a legitimate and meaningful overtake, as well as if that driver manages to recover and retake his position--you got me there! But what does it mean if a faster driver has to slow down to avoid an accident ahead? When the slower driver slips by, isn't that an "artificial" overtake, in that it was due to circumstances out of both drivers' hands, and not their relative skill? And if the faster driver then retakes his position, wasn't the whole exercise for naught, meaningless? A position swap of the type you would see with option tyres? A driver who passes another car because he's shortfueled (only to be passed on his next normal stint) or because his car works better on lighter fuel loads relative to the field doesn't tell us much about relative skill, either; rather, that of the car designers and engineers who calculated the fuel strategies. Again, I don't mean to argue that F1 needs the option tyres--I honestly don't know that I'd keep them if I were Max Mosley--just explain how I justify them to myself as a fan. In the end, you're right--it's all down to taste. It is, as you say, a delicate balance between technology, skill, and the artificiality of rules that attempt to balance them. Interesting thoughts on the traffic jam divide between America and Europe! It makes a lot of sense to me, and there's a certain symmetry in that our claustrophobic, quarter and 3/8 mile ovals are the products of our most rural of areas. I love your nature documentary analogy as well--quite fitting for Earth Day! I hope you get a chance to enjoy the Cup race at Talladega this week, as well. Hope you'll enjoy it more than you did Daytona, and that we'll get a better finish as well. Hi all. Facts are the enemy of truth. I am from Malaysia and also now am reading in English, please tell me right I wrote the following sentence: "But developing a deeper understanding of your.Get the top search engine rankings placement services by search engine optimization seo company india, neuro seo seo for travel websites." Waiting for a reply :-), Chilali.